Discussion in 'Events and Tournaments' started by WiseMan, Apr 15, 2019. 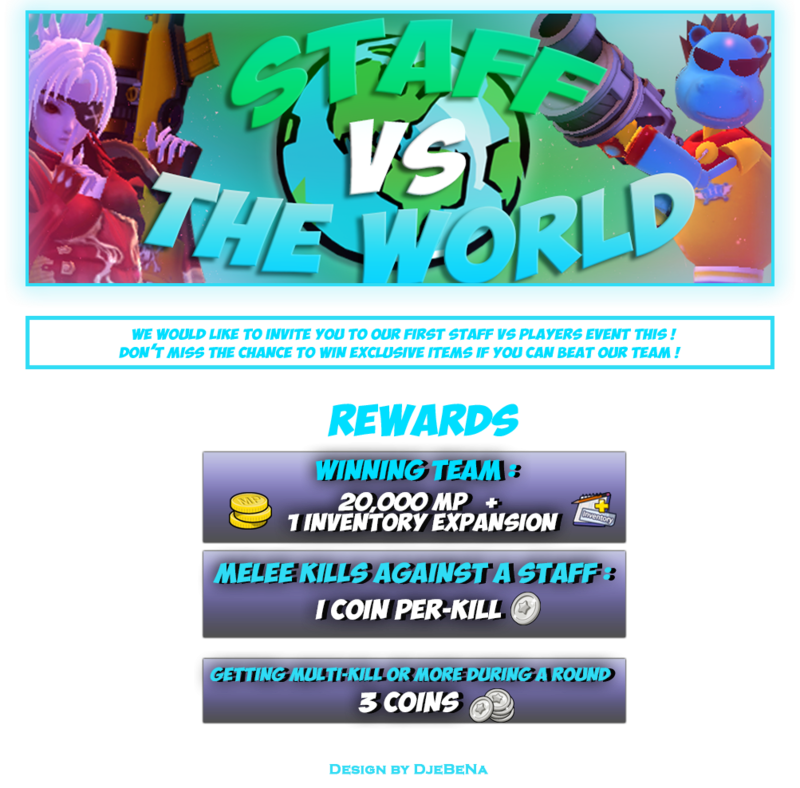 We would like to invite you to our first Staff vs World event Don’t miss the chance to win exclusive items if you can beat our team! - Players will have a chance to battle with our Staff members. - In order to receive the rewards, you need to win a match against our Staff team. - If you manage to kill one of the staff-members with a melee then an extra reward will be given. - Getting 4 consecutive kills or multi kill will grant you an extra reward. - The event can occur in any day , However there will be an announcement on Facebook, forum and discord 2-3 hours before the event starts. - Event modes for this events will be announced randomly in-game. -Regarding what items are allowed , it will be announced by our staff during the event. - Anyone caught using hacks will be out of the event and permanently banned. DjeBeNa and Rami like this. This is no event to sign up for. Rooms will get opened and revealed for you to join.